Conversation Rising in NYC | "Let's Talk, New York!" 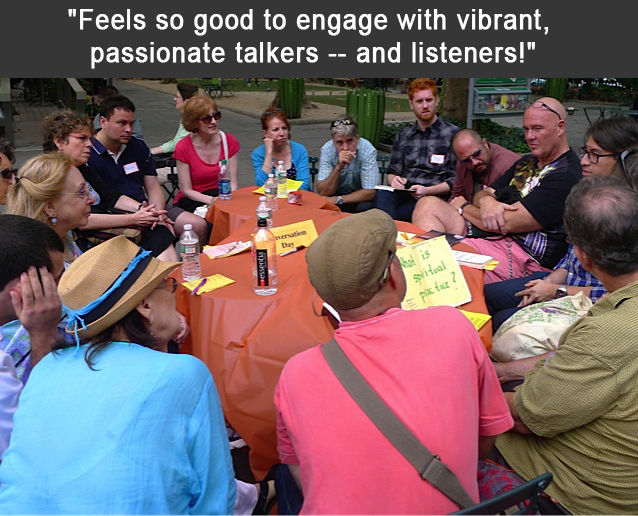 “Let’s Talk, New York!” will be the rallying cry as New Yorkers join exciting conversations during October, at over 100 events offered byConversations New York (www.conversationsnewyork.com). The events will celebrate the publication of Reclaiming Conversation: The Power of Talk in a Digital Age, by Sherry Turkle of M.I.T. Media interviews and reviews of the book will occur throughout the month including the cover of the New York Times Sunday Review on 9/27, a review in the Times Book Review on 10/4, and an interview on NPR’s Weekend Edition on Saturday, 9/27. A TEDxNY Salon on Fri., Oct. 9th to view and discuss Prof. Turkle’s acclaimed TED talk “Connected, But Alone?”, at The Olivia, 315 West 33rd St. (two blocks from Penn Station), at 5:00 p.m.
A Seminar exploring Prof. Turkle’s specific recommendations for Reclaiming Conversation, on Wed., Oct. 14th, at the Adelphi University Manhattan Center at 75 Varick Street, at 6:15 pm. A University Seminar on Reclaiming Conversation with Prof. Turkle, at Faculty House, Columbia University, on Tues., Oct. 20, at 7 pm. RSVP to grossassoc@aol.com.